Searching for Light coloured/red haired SMP clients?? Home › Forums › Scalp Micropigmentation Forum › Searching for Light coloured/red haired SMP clients?? This topic contains 9 replies, has 4 voices, and was last updated by Red 1 month, 3 weeks ago. I have been considering SMP for about a year now, and I’m at the stage where I have been down to Harley street and spoken with Jason, but 6 months on from that I still cant decide whether SMP suits my hair colour. I have red hair and a red beard to go with it, my hair has been receding since I was 15 so as you can imagine now at 28 I’m hanging on by a thread, so its needs to go soon!! I really like the idea of SMP and have researched it a lot and think it looks amazing on darker haired individuals. However the very few light haired cases that I have been able to find has not given me much confidence that it will suit me. Also I have had two mock ups done and honestly the mock ups don’t look good. 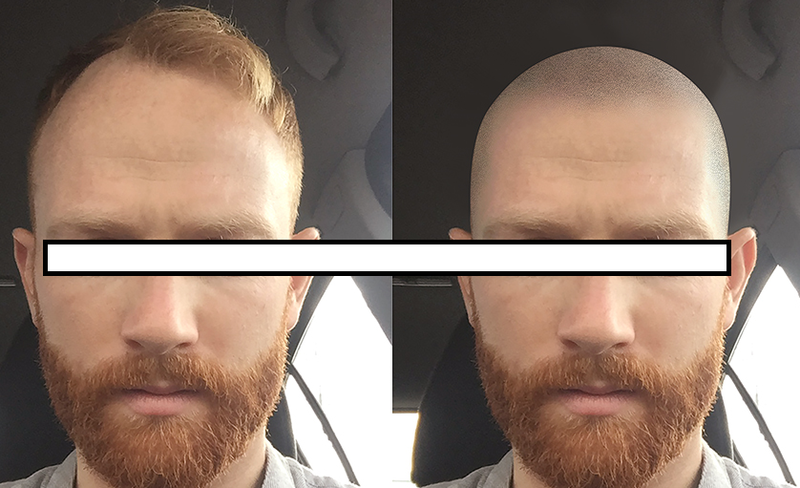 I have blonde eyebrows and a short ginger beard/stubble which is a big part of my look, and the mock ups shade of SMP is basically dark so it just doesn’t look right at all. Therefore I am really on the hunt to find some people who have had the procedure that might be able to help me as I feel I really need to see it in the flesh on someone that has similar shadings to myself, as based on what I know now I wont be getting it done, which will crush my last bit of hope. Can you post some pics of how u currently look? maybe even ur mock ups?? Iv attached my mock up below, let me know your thoughts. I think before I have it done I need to see it done on someone in the flesh that has similar features to me. I will have a look at the guys on you tube you have mentioned though. Have you had had SMP ? If so how long for? Oh man you’ve go nothing to worry about, the mock up looks fantastic. When hair is shaved as short as it can go, it no longer appears red, blonde, brown etc… Instead, it appears to be a certain shade of grey. Skalp match that shade of grey with precision and the effect is an amazigly blended finish. Yeh I see what your saying and to be honest the more I have got more used to the picture now I think it was just the initial shock of first seeing me with shaven head. What has your experience with skalp been like? Are you completely happy with your result? Did you need to see anyone’s results yourself before getting it done or did you just do it? Experience with Skalp was the best i could’ve hoped for… Theu weren’t letting me go until I was 100% happy. There’s even a warranty session that you get for up to a year after ur first session… so if u decide after that time something still needs adjustingto make it perfect, u get another session to sort it out.. Thats how much they care about what they’re doing. I went to a consultation and saw Dereks and Antonios SMP -that was enough to convince me. Also watched just about every video on their youtube channel. Hey Red, how did the SMP turn out? I know this is an old thread, but there isn’t much out there on redheads getting SMP. The first session leave you looking a bit strange to a close eye but no one really notices, I went to a meal with friends I hadn’t seen in ages and they didn’t notice. After the second session you start to relax because it looks more natural but for me with my shading it was still not very noticeable. Then the third sessions done and it almost transforms as it then looks so natural it’s unbelievable.